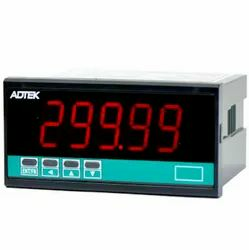 Adtek RPM Indicator series CSx-RL has been designed with high accuracy measurement, display, and communication of pulse (Frequency). Model CS1-RL is the baseline model with option of one relay output and host of other features. Model CS2-RL is an advanced model with multiple relay & analog options. The innovative feature is auto-range input from 0.01Hz~ 100KHz (option ~140KHz) and the display resolution will auto-change to show the highest according to the input frequency. They are also building in 4 Relay outputs, 3 External Control Inputs, 1 Analogue output and 1 RS485(Modbus RTU Mode) interface with versatile functions such as control, alarm, re-transmission and communication for a wide range of testing and machine control applications. 4 relay can be programmed individually to be a Hi / Lo / Hi Latch / Lo Latch / Go energized with Start Delay / Hysteresis / Energized & De-energized Delay functions or to be a remote control. 3 external control inputs can be programmed individually to be Tare (Relative PV) / PV Hold / Maximum or Minimum Hold / DI (remote monitoring) / Reset for Relay Energized Latch…. Looking for Digital Process Indicator ?